DOCTORS AND NURSES wrote to the Taoiseach to express their dismay and fury with him over comments he made about them taking annual leave over the Christmas and New Year period. 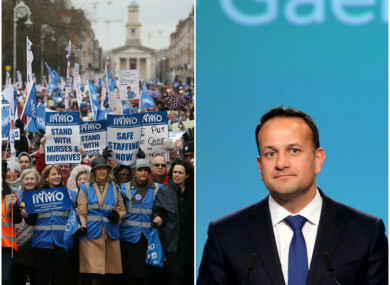 Leo Varadkar was accused of unfairly singling out medical professionals in a “media stunt” and warned his words would add inspire nurses to take to the picket lines and engage in industrial actions. These documents released to TheJournal.ie under the Freedom of Information Act come as nurses and midwives yesterday called off three further days of industrial action. Nurses were striking over pay and conditions but yesterday evening strikes planned for this week were suspended following intervention from the Labour Court. In a statement, the Irish Nurses and Midwives Organisation said it had “suspended the upcoming strikes at the request of the Court to consider the wide-ranging recommendations”. “Members will receive more information on the proposals in the coming days and the recommendation will be put to a ballot,” it added. However, it was clear from November that comments from the Taoiseach had provoked a very strong reaction from nurses and doctors. During Leaders’ Questions in the Dáil on 6 November 2018, Varadkar said consultant doctors and nurses should not be allowed to take Christmas holidays in the first week of the year in order to allow the health service avoid crisis mode this winter. He surprisingly downplayed the government’s own Winter Plan initiative, stating that “we have had a winter plan every winter for 10 or 15 years and it has not worked well”. “We need to make sure, for the first time ever, that during that period the radiology departments and labs are open and working at full whack, that consultants are not on holidays in the first week of the year, particularly those who work in the emergency departments and that nurses are not on leave in the first two weeks of January,” he said. We need to make sure that every bed is open. That is the kind of winter plan we need; not the kind we have had for years and years that does not work. The Taoiseach went on to state that between 22 December this year and 3 January next year there are 12 days, of which seven of those days are Sundays, Saturdays or bank holidays. “What has been happening in our health service for 10 or 15 years is that hospitals effectively closed down for seven days out of 12. “We need to change that,” he said. Varadkar went on to double-down on these comments the following day, telling reporters that he didn’t understand why the comments were controversial, saying he was simply pointing out that services must attempt to meet demand. “So we know peak demand happens in our health service in the first two weeks in January, therefore it makes sense that the minimum number of staff should be on leave during that period,” he said. “No bed should be closed because people are on leave. The emergency department and medical consultants should be there. So it’s a question of meeting peak demand with peak resources, and that’s the norm across industry, the norm across services. It should be the norm across the health service as well. It shouldn’t be a controversial comment to say that when we have peak demand, when patients need our staff most, they should be there. In all, the Taoiseach received 47 correspondences in the wake of these comments. In the letters and emails he received, doctors and nurses took the Taoiseach to task for his comments and claimed he didn’t understand the pressure on health workers. “I am deeply offended by these comments as well as your peculiar phrasing,” one wrote. “I am currently an intern and I can assure you that frontline staff are not the problem. The doctors and nurses are hardworking, doing their utmost to provide a professional and competent service. I thought you would have had more sympathy for the real people running the health service, given your medical background. We are not the problem. A poor health service governed by the joke that is the HSE is. Another woman described the effect that working over Christmas has on her family. “I am a frontline health worker who has yet again this week worked 25% over their hours which will be unpaid in order to ensure our patients are cared for,” one said. “I have three questions for you. Firstly, why is Christmas any different to wait on a trolley than any other day? Secondly, how much leave will you be taking over the Christmas? Thirdly, why should my family have Christmas without me? They see me little enough as it is. I thought your comments yesterday were unhelpful and showed little value of the commitment my team and I have made to our patients over the years. It was clear from many of the letters sent to the Taoiseach that many doctors and nurses were furious. “Just for the record,” one said. “I regularly [...] work 16-24 hour shifts, overnight, with no protected breaks. I’m afraid to drink too much water because I don’t know when I’ll get a toilet break, I don’t know when I’ll get to eat or sleep. Another accused the Taoiseach of being “wholly misinformed” about issues related to doctors and nurses. One medical professional wrote to Varadkar to tell him that they were “extraordinarily angry” over his comments. “I am outraged at your comments, and honestly fearful that you will have only encouraged more doctors and nurses to emigrate,” they said. The Taoiseach was also accused of taking a “cheap shot” at doctors and nurses, of not living in the “real world”, told he’d given nurses a “slap in the face” with his comments and advised to “choose your battles” in future. Another signed off their email “a genuine nurse who has reached the end of the road”. A nurse in an emergency department said: “Why would anyone newly qualified want to stay in Ireland? Why on earth would anyone want to come back? If I had my time again I would have gone elsewhere. We really don’t want to strike but at this point we feel enough is enough. And there was one very brief email with a bit of advice for how shortages of doctors could be addressed. Email “'Think of us as you tuck into your turkey': Letters reveal nurses' fury at Varadkar over annual leave comments”. Feedback on “'Think of us as you tuck into your turkey': Letters reveal nurses' fury at Varadkar over annual leave comments”.